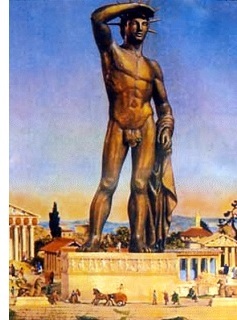 Colossus of Rhodes - One of the Seven Ancient Wonders of the World. A statue of the sun-god, Helios, it was built between 294 and 282 B.C. to commemorate the island's victory over Antigonus Monophthalmus (the "One-eyed"). Antigonus was one of Alexander the Great's generals and tried to conquer his own empire. Made of bronze, the statue was 110 feet tall (33.5m) and was erected at the mouth of the harbor to welcome incoming ships. Unfortunately the Colossus stood for only 56 years due to an earthquake that knocked it over in 226 B.C..